Scholars mark the beginning of the Predynastic Egyptian period somewhere between 6500 and 5000 BC when farmers first moved into the Nile valley from Western Asia, and the ending at approximately 3050 BC, when the dynastic rule of Egypt began. The period of Ancient Egypt history, which includes the period of Predynastic Egypt, stretches over 3000 years and encompasses hundreds of Pharaohs. The Predynastic Egyptian Period is divided into four separate phases: the Early Predynastic which ranges from the 6th to 5th millennium BCE (approximately 5500 – 4000 BCE), the Old Predynastic which ranges from 4500 to 3500 BCE (the time overlap is due to diversity along the length of the Nile), the Middle Predynastic which roughly goes form 3500 – 3200 BCE, and the Late Predynastic which takes us up to the First Dynasty at around 3100 BCE. The Chalcolithic period, also called the “Primitive” Predynastic, marks the beginning of the true Predynastic cultures both in the north and in the south. The southern cultures, particularly that of the Badarian, were almost completely agrarian (farmers), but their northern counterparts, such as the Faiyum who were oasis dwellers, still relied on hunting and fishing for the majority of their diet. Predictably, the various craftworks developed along further lines at a rapid pace. Stoneworking, particularly that involved in the making of blades and points, reached a level almost that of the Old Kingdom industries that would follow. During the Predynastic Period, Egyptians developed a written language and also came up with an institutionalized religion. They developed a settled, agricultural civilization along the fertile, dark soils (Kemet or black lands) of the Nile (which involved the revolutionary use of the Plough) during a period in which Northern Africa was becoming arider and the edges of the Western and Saharan desert spread. 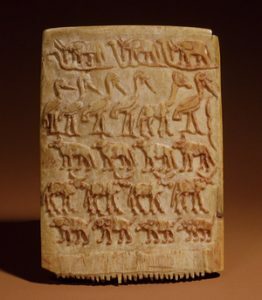 During this era, hunting was no longer a major support for existence now that the Egyptian diet was made up of domesticated cattle, sheep, pigs, and goats, as well as cereal grains such as wheat and barley. Artifacts of stone were supplemented by those of metal, and the crafts of basketry, pottery, weaving, and the tanning of animal hides became part of the daily life. The transition from primitive nomadic tribes to traditional civilization was nearly complete.